There have been a number of partnership announcements from UK distributors this week. First up, Exertis has announced the availability of Ricoh’s entry-level Multi Function Device (MFD) range. Although available through Exertis, the products will be delivered and supported by Ricoh. This ensures that Exertis’ reseller partners will benefit from working direct with a Tier One copier vendor who will provide them with service, support, staff, engineers and delivery resources. “There is considerable demand from traditional copier customers for powerful yet cost-effective MFDs. With these latest additions from Ricoh, we have a thoroughbred copier product to take to the channel with a service to match that’s fully and reassuringly supported by Ricoh,” commented Jamie Brothwell, print general manager at Exertis. In other distie news, Azlan, Tech Data Europe’s specialist brand for value-added distribution of enterprise networking, server, storage and software solutions, has announced that it has signed a pan-European distribution agreement with Veritas Technologies Corporation LLC, giving value-added resellers across the region the opportunity to offer the newly-independent company’s backup and data protection solutions to their customers. 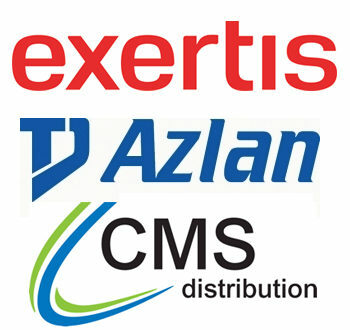 The agreement will enable resellers to take advantage of extensive value-added services offered by Azlan in taking Veritas’ advanced solutions to market, including sales acceleration services, such as Azlan’s connected Business Solution Centres for end-user customer briefings and demonstrations, Azlan value marketing for collaborative demand generation, sales and technical training, and professional services. “This is a very exciting development for Azlan and for Veritas reseller partners. Veritas is an iconic brand that is synonymous with world-class software products and innovation,” said Simon England, senior vice president, Value Added Business, and managing director, Azlan Europe. Last but not least, CMS has signed Securifi in an exclusive agreement to distribute its range of home networking products in the UK and Ireland. As well as this, CMS has also extended its hardware portfolio with Netgear’s ReadyNAS solutions. Daniel Pell, commercial manager at CMS Distribution, said: “We are delighted to announce our ability to integrate WD drives into the award-winning Netgear ReadyNAS storage range. Utilising our purpose-built integration facility based in Castleford, we will be able to offer bespoke solutions to our customers.